Have you been performing your so called “core stability” exercises but actually have no idea what they are, or if you’re doing them correctly? Have you been given general, non-specific exercises for your management of low back pain, pelvic pain, hip and groin pain including hip osteoarthritis and chronic low back pain, but are finding that nothing is helping? We can help you! Real time ultrasound allows you to master your rehabilitation. Keilor Rd Physiotherapy is pleased to provide the service of Real Time Ultrasound (RTU) for their patients. RTU is a state-of-the-art diagnostic ultrasound machine, used in the imaging and visualisation of the deep stabilising muscular system around the spine, pelvis and hip joints. The RTU is a brilliant, safe, non-invasive tool used both in the assessment and treatment of many conditions including low back pain, pelvic girdle pain, hip labral tears and hip osteoarthritis, pelvic floor weakness and associated incontinence. 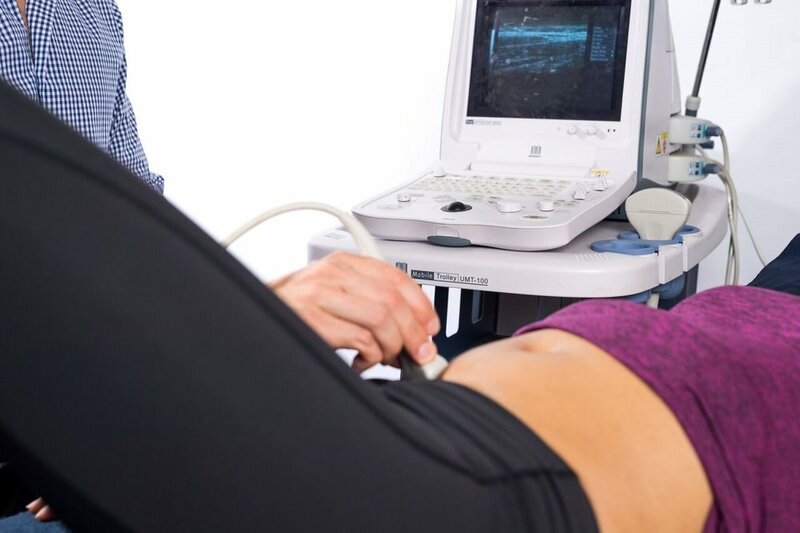 The Real Time Ultrasound allows the treating physiotherapist to dynamically visualise the movement of deep tissues (fascia and muscle) as they occur in real time. Research suggests that certain deep muscles play a key role in the stabilisation of the spine, pelvis and hip joints and that the activation and timing of these key muscles is impaired in people who suffer, or have previously suffered from low back, pelvic and hip pain. Because these muscles are deep stabilising muscles, it can often be difficult to feel whether or not they are contracting properly, the RTU allows accurate assessment of the correct timing of these muscles that can then be retrained and taken into more functional movements and exercise programs, such as Pilates, gym and also home based exercise programs. The RTU is a visual form of biofeedback for the re-education of the correct timing and sequencing of muscle activation during exercise and daily function. This allows the patient to experience the correct pattern of contraction firstly in isolation and then take this into the rehabilitation phase.